Artists Archives of the Western Reserve (AAWR) is proud to announce Remembrances: The Art of Joseph McCullough, a retrospective exhibition of the work of the influential educator and painter. The public is invited to attend this free art exhibition and the opening reception which will be on Friday, January 18, 2013 from 5:00 pm to 8:00 pm. Remembrances will be on display through February 15, 2013. Joseph McCullough, an Archived Artist with AAWR since 2002, passed away on November 17, 2012 while this exhibition was being developed. The Pittsburgh native, born in 1922, first came to Cleveland in 1940 to study at the Cleveland School of Art. That school was the predecessor organization to the Cleveland Institute of Art which he subsequently headed for 35 years. The Yale graduate was a dominant force in art education, having served as President of the National Association of Schools of Art & Design. McCullough also had major impact on Cleveland’s public art, having served as chairman of the Fine Arts Advisory Committee for the City of Cleveland’s Planning Commission. 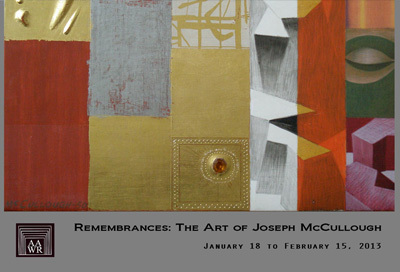 Joseph McCullough was a painter of the highest order, as evidenced by the assemblage of art on display at the AAWR exhibition. His talent as an artist did not go unnoticed; he was awarded the Cleveland Arts Prize for Visual Arts in 1970. Other major awards of his included the National Watercolor Award and the Rome Collaborative Competition. Some of his works can be seen on the website of Artists Archives of the Western Reserve at www.artistsarchives.org/artists/Joseph_McCullough.